Cherry Mobile will be having a nationwide sale for its current flagship phone, Cherry Mobile W900, on August 15. This sale is part of Cherry Mobile’s 3rd-year anniversary of being the top local cellular brand. 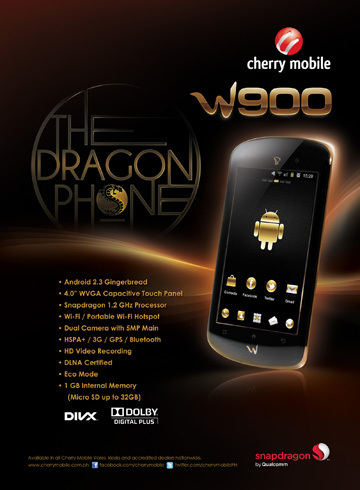 Dragon phone was announced back in May and presently the flagship smartphone of the company. The sale will slash Php 8000 off from the original price of Php 14,999 making a great deal for the Dragon Phone with only Php 6999 price tag. You can grab this offer in any Cherry Mobile kiosks nationwide. Dragon Phone sports a 4-inch screen with 480x800 resolution. Likewise it’s one of the fastest phone in the market with its 1.2 GHz Qualcomm Snapdragon S1 chip. Other deal-makers are the 5MP shooter and microSD card slot (expandable to 32 GB). It comes with Android Gingerbread out-of-the-box but Cherry Mobile promises to give an ICS update for this phone.